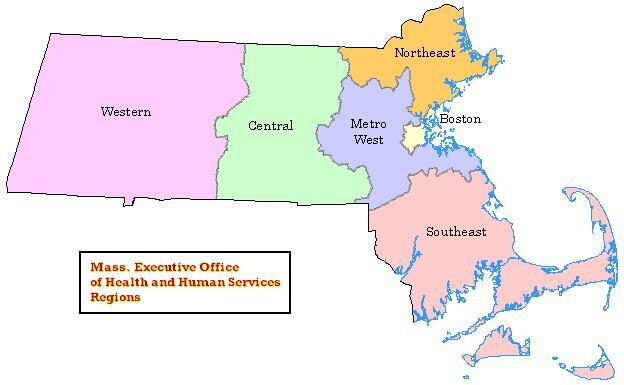 This datalayer represents the six regions delineated by the commonwealth's Executive Office of Health and Human Services (EOHHS). These regions are used by the Department of Public Health for statistical, care coordination and administrative purposes. The regions - Western, Central, Northeast, Metro West, Boston and Southeast - are based on geographical groupings of cities and towns (see map). MassGIS received a list of town IDs and associated regions from staff at the Department of Public Health, Office of Data Management and Outcomes Assessment (ODMOA) and joined it to the TOWNS layer. The layer was then dissolved by region to produce the six multi-part polygons in ArcMap. Population values were summed across each region and joined to the layer. Arcs were coded in coverage format in ArcInfo Workstation and converted to a geodatabase feature class. The Massachusetts Department of Public Health will provide any updates to MassGIS. The March 2019 update of this layer includes the populations from the 2010 Census.